Rapper Snoop Dogg and the League of Young Voters came together to host a panel about police brutality and the chaotic events that unfolded in Ferguson, Missouri, after 18-year-old Michael Brown was fatally shot. In addition to Snoop Dogg, the panel also welcomed Michael Brown’s father, Michael Brown Sr.; Jordan Davis’ mother, Lucia McBath; attorney Benjamin Crump and Chuck Creekmur of AllHipHop. The panel, titled No Guns Allowed: Fallout From Ferguson, took place during the BET Hip-Hop Awards weekend in Atlanta. The group of panelists discussed what the African-American community needs to do to help solve issues of racism and police brutality. For many of the panelists, the key was to keep the conversation going. Social media vehicles like Black Twitter, the online sub-community that has become the topic of major academic and societal discussions, have been adamant about making sure issues of racism and police brutality are no long swept under the rug. Meanwhile, more media outlets are trying to pay closer attention to Black victims. Of course, conversation won’t be enough to result in change. 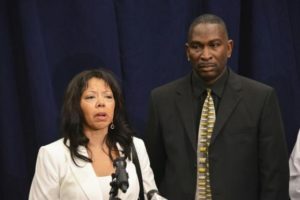 McBath, the mother of the Black teen who was gunned down for playing loud music at a Florida gas station, said the African-American community has to make sure the lawmakers are fighting for change as well. She went on to reveal that she has had a hard time getting people to take action. In the case of Jordan Davis, many people feel justice has not been served. While the shooter, Michael Dunn, was found guilty on four counts of attempted second-degree murder, he was not found guilty of actually killing Davis. Then there was the acquittal of George Zimmerman that sent the entire nation into shock. Zimmerman was the volunteer neighborhood watchman who fatally shot 17-year-old Trayvon Martin in a Florida neighborhood in 2012. Now the nation is watching anxiously as a grand jury has been formed to decide Ferguson police officer Darren Wilson’s fate. Wilson has yet to be arrested for fatally shooting Michael Brown several times even after the teen allegedly put his hands up to surrender. The grand jury is allowed to wait until 2015 to make a decision about the case.